Henbit (Lamium amplexicaule), an annual weed, sprouts in garden beds and lawns in fall, and it flowers and sets seed in late spring. Bearing pinkish-white to purple, trumpet-shaped flowers, henbit grows up to 16 inches tall. The plants have purplish, square stems and coarse, hairy, toothed leaves. Effective control involves removing henbit plants before they set seed, and preventing existing seeds from sprouting. Hand weeding and mulching control henbit weeds in garden beds. Remove henbit plants whenever the soil is moist and before the plants flower. Grasp the weeds firmly at their bases and pull them out smoothly to avoid breaking the taproots. Spread a 3-inch layer of organic mulch, such as wood chips, well-rotted manure, leaf mold or shredded bark, which prevents henbit seeds from sprouting. Top up the mulch whenever it thins out or, alternatively, lay landscape fabric in established garden beds, and spread a 2-inch layer pebbles, gravel or other inorganic or organic mulch over the fabric. 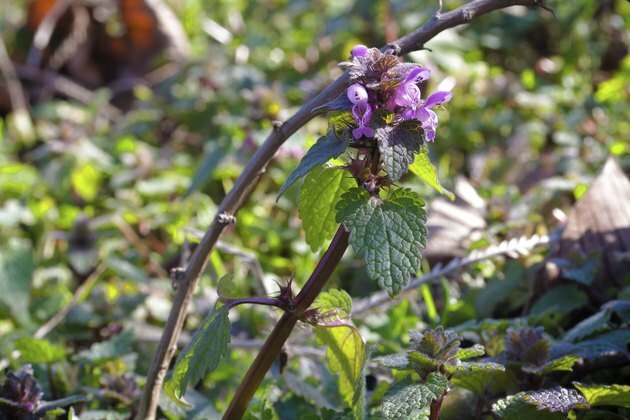 Henbit weeds invade thin lawns in shady spots, but improving lawn maintenance can suppress them. Water the lawn so the soil is constantly moist, and mow the grass regularly to encourage dense growth. Fertilize the lawn with a 32-0-4 lawn feed applied at a rate of 2 1/2 pounds per 1,000 square feet every eight weeks while the grass is actively growing. When temperatures are above 90 degrees Fahrenheit, water the lawn after applying the fertilizer. If the lawn grass doesn't thrive in shade, reseed with a shade-tolerant variety, such as St. Augustinegrass (Stenotaphrum secundatum), which is a warm-season grass that grows in U.S. Department of Agriculture plant hardiness zones 8 through 10, or the cool-season grass red fescue (Festuca rubra), which is hardy in USDA zones 3 through 7. 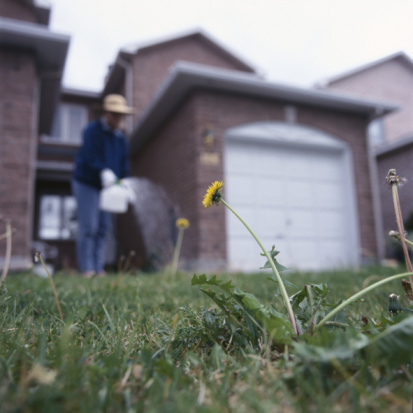 A pre-emergent herbicide prevents henbit seeds from sprouting in your lawn. Henbit seeds sprout in fall, but a pre-emergent weedkillers create a chemical barrier that prevents henbit seedlings from growing. Spread a herbicide containing 1.71 percent pendimethalin product in early fall at a rate of 2 pounds per 1,000 square feet, or according to the label's instructions. 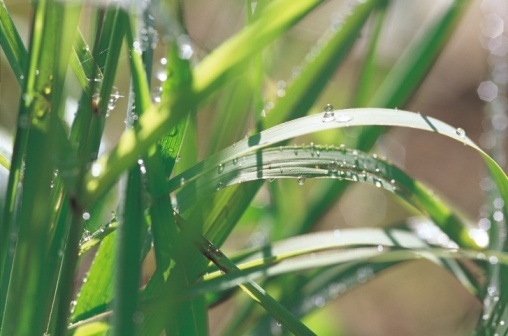 Pre-emergent herbicides are activated by water, so apply 1/2 inch of water if it doesn't rain for 48 hours. Don't apply pre-emergent herbicides to newly seeded lawns, or in areas that will be overseeded within two months. Spraying a selective broad-leaf herbicide controls henbit weeds in lawns in spring. Broadleaf weedkillers control henbit and other broad-leaved plants but don't harm grass. Apply a ready-to-use 7.59 percent 2,4-D, 1.83 percent mecoprop and 0.84 percent dicamba product on a dry, still day in early spring before the henbit plants flower. Water the lawn if it hasn't rained for 24 hours, and put on a long-sleeved shirt, long pants, gloves and safety glasses before spraying the product at a rate of 4 fluid ounces per 1,000 square feet on cool-season lawns, or 2 fluid ounces per 1,000 square feet on warm-season lawns.